﻿A police interrogation room. A woman has been detained for questioning after her boss is found dead in suspicious circumstances. In a room down the hall, her colleague also awaits an interview. Just routine questions. Just routine. But what if the monotony of routine was responsible for pushing one of them over the edge? When does bored become bored to death? After all, perhaps it’s not unusual for employees of an adhesive supply company to feel a little … stuck. "Above Bored" focuses on dialogue rather than physical action to create status and tension. The script marks a new stage of exploration in writing style for ‘Owdyado, this third full-length show putting an emotional narrative at the centre whilst retaining the quirks and plot twists associated with their previous work. 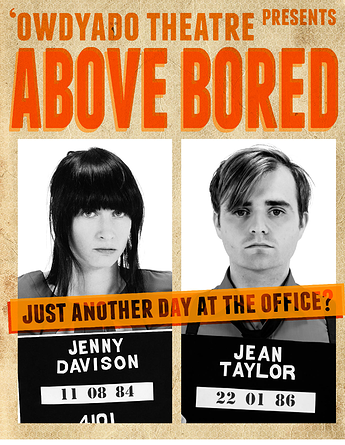 "Above Bored" is supported using public funding by the National Lottery through Arts Council England.